MBL has registered as an affiliated member of the Edinburgh Marathon 2008 which takes place on Sunday 25th May. We need runners to join the MBL team. This is a great opportunity to raise funds and awareness to support Chinese orphans and disabled children and children in rural areas who do not have access to education. In the past the money raised by our marathon runners has helped us to sponsor a primary school in Qinghai by paying for tuition fees, a rural school library, food and transport for children whose families were unable to do so. We have also provided medical care for disabled children and sponsored life-skills programmes in various orphanages in China. Past funds have also been donated to Tongjiang in the Sichuan province to help families affected by the summer flooding to rebuild their homes and schools. To learn more about our projects please visit our website www.motherbridge.org. Your participation in the 2008 Edinburgh Marathon can make a big difference to the lives of disadvantaged children in China. If you are interested in joining our team, or may know of someone who would be, please contact us. Giles Whilttell reviews the George Hogg biography by James MacManus on the Times. The biography, Ocean Devil, has recently been adapted into a film, Children of Huang Shi, starring Jonathan Rhys Meyers, Chow Yun Fat and Michelle Yeoh. And the great rolling convulsion that seized China for 23 years, devouring tens of millions of innocents but leaving Mao triumphant, was another. This was a maelstrom of overlapping wars, famines, floods and generalised destruction fuelled by the greed of warlords, Japanese fascism, paranoid Chinese nationalism and overcooked Marxian ideology. Through the chaos ran the fragile threads of countless individual stories, but few can have been more astonishing or, in the end, uplifting, than that of George Aylwin Hogg. 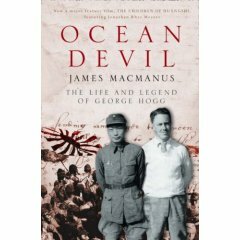 James MacManus, then a foreign correspondent for the Daily Telegraph, first heard about Hogg in an eavesdropped conversation at the British Embassy Club in Beijing in 1984. The account that he has pieced together since is of an Englishman abroad, but hardly of the cliché those words suggest. Hogg had the prodigious stamina so often traced to the rainswept playing fields of English public schools, and he stood out in China for other obvious reasons, including his height, his hair, his “high nose” and the colour of his skin. But more than any of his compatriots who immersed themselves in war-torn China, he stands out for something else entirely: his goodness. THREE years ago, teachers and pupils from Grantown Grammar went on a trip which had a profound influence on them and the school. Eight pupils and two teachers travelled to Beijing to take part in a three-week language and culture course run by the British Council which for many of them began a fascination with all things Chinese. Today, visitors are often surprised to see examples of Chinese calligraphy on the walls – and to learn this small school is one of the first in the UK to offer a chance to learn basic Mandarin. (Manchester April 19, 2008) More than 2000 Chinese students and professionals gathered outside BBC’s office in Manchester, protesting against biased reports during recent events in Olympic Torch Relay and Lhasa riot. On April 6, 2008, the same day as the auspicious snow welcome the Olympic torch relay in London, the Academy of Life Sciences for Chinese in the UK (ALSC-UK) announced its official foundation in the Education Section of the Chinese Embassy based in London. ALSC-UK is the senior members club of the Chinese Life Scientists Society in the UK (CLSS-UK) and is the brainchild of Minister Counsellor Mr Yongda Wang of the Education Section of the Chinese Embassy. At the inauguration meeting, Professor Mingqing Du from Cambridge University introduced the principles of this new initiative and the meeting agenda. Dr. Wei Wang from De Montfort University described the preparing processes of the meeting and the ALSC-UK. Dr. Henglong Hu from GlaxoSmithKline presided over the discussion on the Chinese and English names of the Academy and the titles of its members in both Chinese and English, as well as the structure and leadership of the Academy. Professor Xin Lu from Oxford University led a warm discussion on the unique opportunities, rights and responsibilities of the members of the ALSC-UK. Thousands of pro-China demonstrators and Beijing Olympics supporters are to march in several UK cities this weekend. London, Manchester, and Glasgow will see demonstrators march in the city centre to protest the biased media report of the recent violence in Tibet and during Olympic torch relay. The protesters will also express their support of China and the Beijing Olympics. The organisers and participants are mainly Chinese students in the UK. Many living in other cities are said to travel to the three cities to join the demonstration. It is believed the demonstration in London will be the largest among the three. Protesters are planning to march to Westminster area and White Hall. In Manchester, the demonstrators will hold a “silent protest” against BBC’s bias and misreporting during Tibet riots and Olympic torch relay. The Glasgow march will pass through the city’s main shopping area and Chinatown. The three demonstrations will be held more or less the same time this Saturday (19 April). The organisers of the three cities told LinkChinese UK News they made the decision of holding the protest independently, after seeing the “distortion of facts, biased journalism and anti-China mentality” of western media when reporting recent riots in Tibet and the disruption of Olympic torch relay. The organisers and participants are encouraged by last weekend’s Edinburgh demonstration. “There were a huge number of people joining the march in Edinburgh, among them were many students from Glasgow and other nearby cities. I hope those who share our feelings will join us this Saturday just as they supported Edinburgh march.” Wu Yuxiang, one of the organizers of Glasgow march told LinkChinese UK. BBC Radio 5 Live’s Donal MacIntyre programme sent an undercover journalist to meet immigration advisors from two firms who advertised their service on Chinese newspapers. Posted as immigrant whose salary level is not enough for the new point-based system, the undercover journalist were told by both advisors to forge the income. A legal practice based in London called Keyard Law Associates - who call themselves immigration law specialists - advertised in a Chinese language newspaper offering to “design plans” for immigrants on low incomes to apply for highly-skilled migrant visas. The Chinese undercover journalist with Radio 5 Live’s Donal MacIntyre programme answered the advert and met Mr Wong, an adviser with the firm, at his office in London’s Chinatown. She posed as a foreign national who was not earning enough to qualify for a visa to allow her to stay and work. “The key point for you is finding a company in China which is willing to give you documents to prove your income,” he said. The Home Office will not appeal last week’s High Court decision which found its attempt to backdate changes to immigration rules for highly-skilled individuals was illegal. In November 2006 the UK began moving to a points based immigration system but the Home Office wanted to effectively backdate this - so anyone living and working here under a permit from the old system would have to reapply or leave the country. The government was taken to court by volunteer group the Highly Skilled Migrants Programme Forum.